The darkest form of ultraviolet light, known as UV-C, is unique because of its reputation as a killer – of harmful organisms. With wavelengths of between 200 and 280 nanometers, this particular form of UV light penetrates the membranes of viruses, bacteria, mold and dust mites, attacking their DNA and killing them. Sanitization with UV-C light has been around for more than 100 years, following Niels Finsen's discovery of UV light as an antidote to tuberculosis, which won the Faroese-Danish physician the 1903 Nobel Prize for Medicine. Currently, most deep-UV lamps are mercury-based. They pose a threat to the environment, and are bulky and inefficient. A Cornell research group led by Huili (Grace) Xing and Debdeep Jena, along with collaborators from the University of Notre Dame, has reported progress in creating a smaller, more earth-friendly alternative. 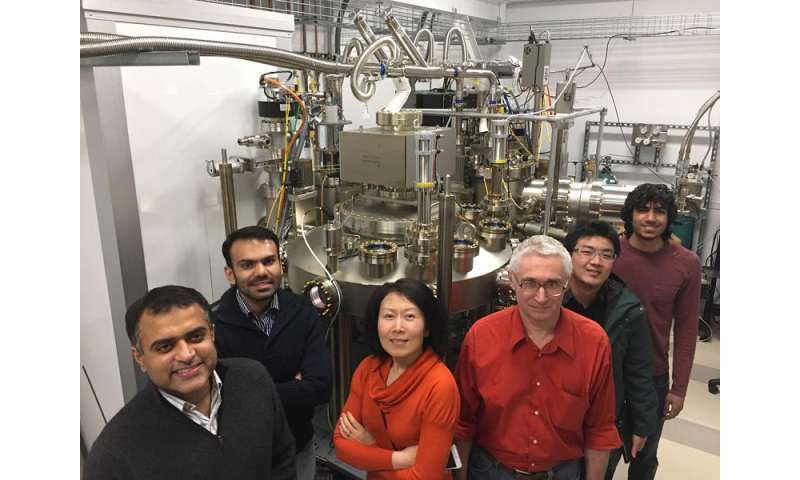 Using atomically controlled thin monolayers of gallium nitride (GaN) and aluminum nitride (AlN) as active regions, the group has shown the ability to produce deep-UV emission with a light-emitting diode (LED) between 232 and 270 nanometer wavelengths. Their 232- nanometer emission represents the shortest recorded wavelength using GaN as the light-emitting material. The previous record was 239 nanometers, by a group in Japan. "MBE-grown 232-270 nm deep-UV LEDs using monolayer thin binary GaN/AlN quantum heterostructures" was published online Jan. 27 in Applied Physics Letters. Postdoctoral researcher SM (Moudud) Islam, the lead author, said: "UV-C light is very attractive because it can destroy the DNA of species that cause infectious diseases, which cause contamination of water and air." One of the major challenges with ultraviolet LEDs is efficiency, which is measured in three areas: injection efficiency – the proportion of electrons passing through the device that are injected into the active region; internal quantum efficiency (IQE) – the proportion of all electrons in the active region that produce photons or UV light; and light extraction efficiency – the proportion of photons generated in the active region that can be extracted from the device and are actually useful. "If you have 50 percent efficiency in all three components … multiply all of these and you get one-eighth," Islam said. "You're already down to 12 percent efficiency." In the deep-UV range, all three efficiency factors suffer, but this group found that by using gallium nitride instead of conventional aluminum gallium nitride, both IQE and light extraction efficiency are enhanced. Injection efficiency is improved through the use of a polarization-induced doping scheme for both the negative (electron) and positive (hole) carrier regions, a technique the group explored in previous work. Now that the group has proven its concept of enhanced deep-UV LED efficiency, its next task is packaging it in a device that could one day go on the market. Deep-UV LEDs are used in food preservation and counterfeit currency detection, among other things. Further study will include packaging both the new technology and existing technologies in otherwise similar devices, for the purpose of comparison. "In terms of quantifying the efficiency, we do want to package it within the next few months and test it as if it was a product, and try to benchmark it against a product with one of the available technologies," Jena said. UV is a half-measure. Gamma rays used to irradiate milk can make it last for six months. Gamma irradiation of polyethylene makes it far more resistant to heat. Gamma irradiation of foodstuffs would eliminate the spoilage seen in places that don't have efficient refrigeration facilities and help alleviate food shortages.